The Capitol Steps brought down the house yesterday at Northshore Performing Arts Center in Bothell with their unique blend of music and political comedy, known by fans as “putting the mock in democracy”. The comedic vocal ensemble has performed for five US Presidents, traveled to all 50 states (to perform, not sightsee), and if their wish came true tomorrow, Donald Trump would be elected President for the comedic potential. A Capitol Steps performance can proudly claim to be the only place in America where audiences will find the two candidates running for President onstage singing show tunes. Founded by Congressional staffers, the group is currently celebrating it’s 30th year of existence while having recorded 31 albums. Darlings of the NPR crowd, no political viewpoint is safe from their talented wit. Especially creative was a musical number spoofing the financial problems of Greece, performed to the music of the Broadway smash, Grease. Yesterday’s show was not for the faint of heart nor for those considering a run for office. 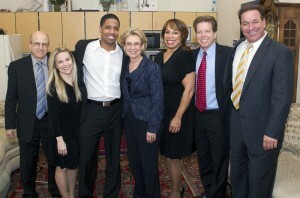 Governor Christine Gregoire was in attendance and clearly enjoyed the show, as did the sold-out audience of 600. A fan attending her third performance, Ms. Gregoire visited with the cast after the show.